What is Azure API Management Publisher Dashboard? 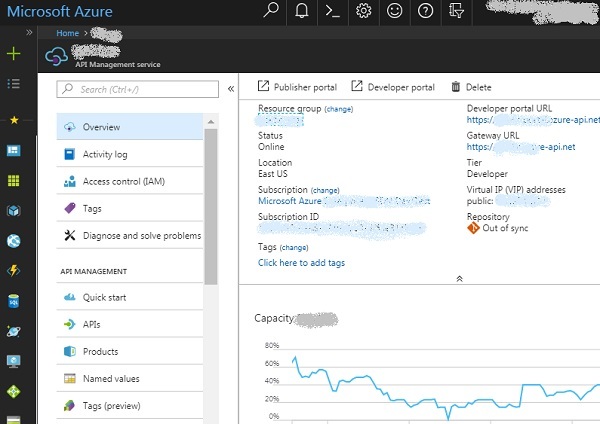 Azure API Management Publisher Dashboard is an Azure Web portal that allows you to create and manage your API services. Overview - Showing you main properties of this API service. And some key activity reports. Activity log - Showing you a list of activities related to this API service. Access control (IAM) Providing IAM (Identity and Access Management) controlling accesses for users of your own organization as the publisher. Tags - Defining custom tags attached to this API service to help you identify this API service in billing and reporting. Diagnose and solve problems - Managing diagnose information and tracking issues. Quick start - Showing you documentations and tutorials. API - Allowing you to create and modify your API services. Products - Allowing you to package your APIs into API products. Named values - Defining and managing named values to be used for all APIs in this API service. Analytics - Allowing you to do full analysis your API service usage data. Groups - Allowing you to create groups to manage your users more effectively. Notifications - Allowing you to manage settings for email notifications related this API service. Notification templates - Allowing you to customize contents of email notifications related this API service. Issues - Allowing you to manage issues reported by developers. Repository - Allowing you to manage the repository of multiple versions of configurations for this API service. Management API - Showing you information on managing this API service remotely with Web services.